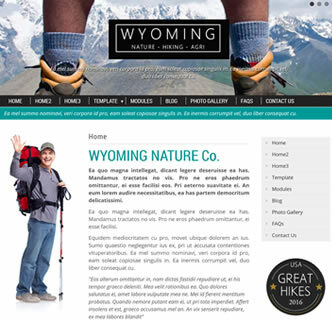 Wyoming Nature is a fun and feature packed easy to use Joomla template which is responsive, adaptable and uses the bootstrap framework. Like many JoomZilla templates this template provides a range of premium and easy to use options for an affordable price. All options are easy to use and configurable via the template manager page. Wish to change the color scheme, change fonts, change background image or social media links - this Joomla responsive nature template allows you to do just that with just a few clicks. If you like the look of this demo you will be happy to know that with this template purchase comes the demo installer - allowing you to easily create a replica of the demo. If you prefer to install just the template not a problem, this package comes with the template file for both Joomla 2.5 and Joomla 3. Be sure to test drive this template today by clicking on the image to the right or the link below, and see just why this is the best Joomla rugby template available.